Barn wood picture frames are frames that are made from wood that is weathered or aged, like the wood often found in an old barn. In addition, the wood may have nail holes, knots, etc. Barn wood frames typically come in natural colors which vary according to the wood they are made of, but also come in lightly stained or painted versions that allow the natural look of the wood to easily show through. 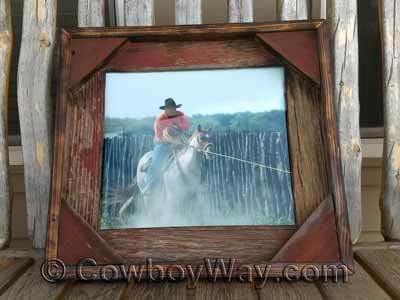 Barn wood pictures frames are a favorite to add a warm, "country" feel to a room. 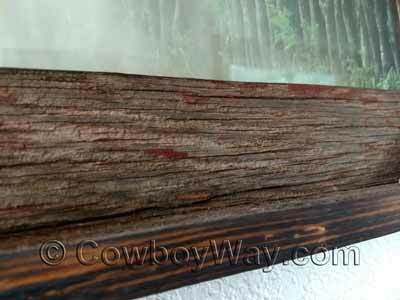 Below: A barn wood picture frame with a fading, weathered, deep red stain. The variations in the stain and the blemishes in the wood are not considered defects in barn wood items; Instead, it's the natural, weathered appearance that gives the wood its beauty. Below is an excellent selection of barn wood picture frames from eBay, Etsy, and Amazon. This page makes it easy to compare selection and prices between these three major sellers all on one page. Below: A close up of the barn wood frame at the top of this page. Notice the beautifully weathered appearance of the wood. 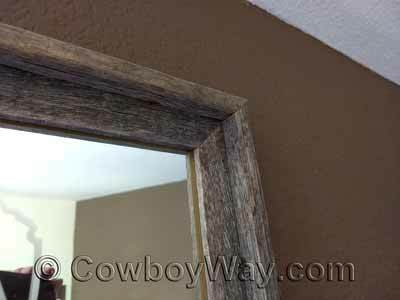 Below are a few good things to know before buying a barn wood picture frame. Is the frame new or used? What size of photo does it hold? What is the size of the frame itself? What is, and isn't included, with the frame? For example, the following items may, or may not, be included: Glass, matting, backing, a hanger, easel backing, and/or other items. Is the barn wood real or faux? Yes, there is faux barn wood. Not everyone has access to aged wood from an old barn or other wooden structure. However, newer wood can be treated so that it has an aged, weathered appearance like genuine old barn wood. 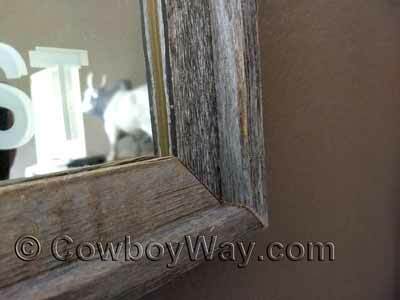 It may or may not matter to you if a frame you like is actually real barn wood or faux, but if it does matter be sure to read the description so you know what you're getting. Is a picture included with the frame? Usually not, but occasionally you can find a barn wood frame with a picture included. And, no, we don't mean the "placeholder" type of picture often included with a frame: We mean a nice photo or picture meant to be displayed, not replaced with one of your own. Is shipping included in the price? If not, how much will it be? Does the seller accept returns? If so, what are the conditions for the return? Below: A barn wood frame in a natural color. This one is used with a mirror instead of a picture. Below: Another look at the same barn wood frame shown above. If you find a barn wood picture frame that you like on Amazon but you're not ready to purchase it right away, you can always add it to your shopping cart so it will be easy to find later. In the meantime, if you want to check out with other items, click "Save for later" to move the frame to a separate, but still easy-to-find list beneath your shopping cart.